The first panelist, Vanisa Dhiru, stated that violence against women is on the rise in her homeland, New Zealand. She spoke about some of the key initiatives and best practices that give reason to be optimistic about stemming the tide of violence. Legislative change, long term government-led initiatives, and culturally sensitive measures undertaken by Maoris and certain immigrant groups can all be effective. She also noted methods by which New Zealand has promoted initiatives undertaken by men in violence-prone communities through awareness raising campaigns. The second panelist, Junhui Joo from Korea, spoke on several issues regarding violence against women. She discussed the role of mass media, women’s NGOs, anger management, and the effectiveness of criminal prosecution. She compared the American and Korean systems, with emphasis on prevention, punishment, and healing. She also stressed the importance of women’s self-confidence, empowerment, and economic participation. The first panelist, Yun-Sook Lee from Korea, stressed that Asia Pacific women are not exempt from dangers associated with climate change. She suggested some specific ways to integrate gender considerations in climate change adaptation in the Asia Pacific region. Recommendations included: using reusable cloth shopping bags, reusing school uniforms after graduation, and increasing the use of public transportation. The second panelist, Rae Duff from New Zealand, elaborated on this subject. She noted that women in ICW member countries are well positioned to take up the challenge of promoting sustainable lifestyles to reduce the effects of climate change. Useful suggestions can be found in ‘Toolkit of Resources for Community Education to Reduce the Effects of Climate Change’ produced in 2008. She noted that there is much that can be done both collectively and as individuals to help combat the effects of climate change. 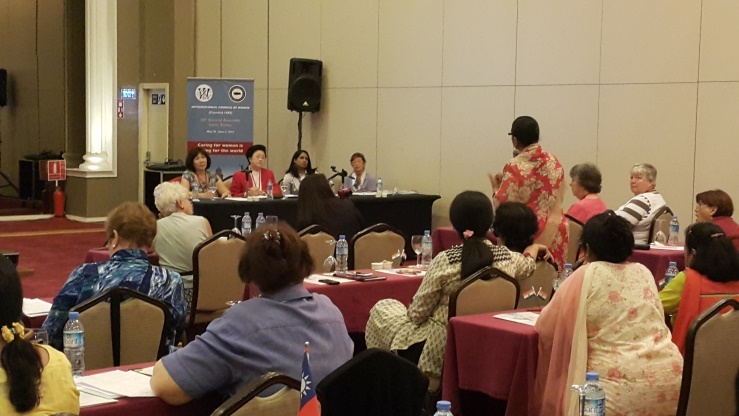 APRC President, Dr. Monthip S. Tabucanon, also gave insightful presentations on “Violence against Women” and “Gender & Climate Change Adaption” in Thailand.